what size trolling motor so you have? Post subject: what size trolling motor so you have? guide for years. Great motor! I have another motorguide bow mount with foot pedal control that I think is just to big for my 1442 alumacraft. I don't see me using it. so what do you have, where is it mounted, how ya like it? pics would be great. tia. I fish rivers and it works well and has some nice features including infinite speed control, batt meter, and a killer handle that adjusts in all sorts of positions. Amazon had the best price and it was on my door step in two days. Don't forget to order a circuit breaker and a quick disconnect for wire harness. Being the boat has a tiller steer outboard and a middle bench seat I didn't want a bow mount. Boating and fishing is enough work as it is. I sure don't want to be going back and fourth in the boat while on the water. I keep all my gear up front and never leave the back. Also helps with weight distribution. I may end up mounting battery in front also. We have had a hell of a dry spell here and the river is about dried up. I couldn't even launch. Covered her up and stuck it out back so wont be any pics for awhile. I have a new Minn Kota Traxxis 55lb on the transom of my 1448 Tracker Grizzly. It had a 55# Minn Kota bow mount when I got it. I hated that motor - very hard to deploy and retrieve. It made me so crazy that I stopped using it. I also never never used it enough to be good at running it - mainly oversteering it all the time. The back seat is my position on the boat and now all the controls are there. 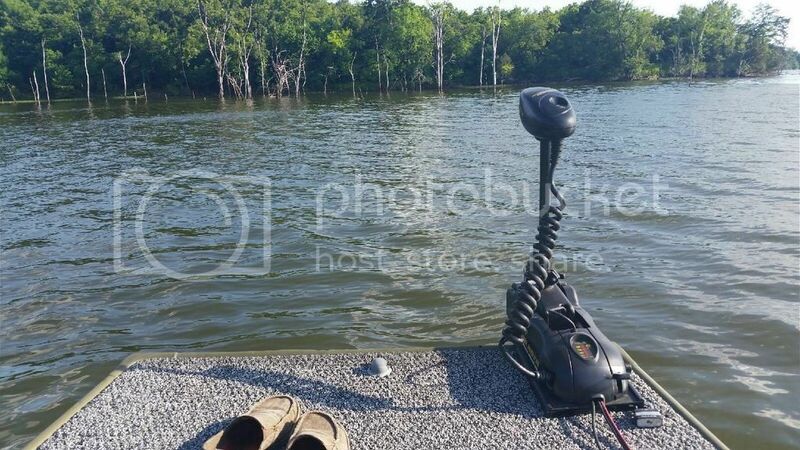 No more having to go forward every time to deal with the trolling motor. The one thing about the transom mount, at least on my Tracker, is locating it. With an outboard in place there is barely room for both it and the trolling motor to operate. Because of the welded gusset in each corner of the stern and the location of the welded handles on the transom, the space available to mount the TM is limited. I have looked at modifying the mounting bracket but no doubt that would void my warranty. The alternative is to fab some kind of mount that would give more flexibility. Ideally MinnKota would produce a surface mount bracket as an accessory - I wrote to them to suggest it but it's unlikely that'll ever happen. The mount design as it is assumes it'll be either in place of the outboard or that there is more room on the transom. A 1448 jon boat hasn't all that much room on the transom once the outboard is in place. I just put a 70lb thrust MinnkotaPowerdrive w Ipilot bowmounted on my 16 ft modified v.
I fish a pretty fast river a lot ( I live a few blocks from the launch) and its nice to have the power when you need it. I got a deal on it because some guy bought it and hated the remote feature used to control it, he was used to foot control. I probably would have bought something a little less fancy if I hadnt been offered this one at such a discount. I do like it though, especially the fact that it has gps and you can use the spotlock feature to hover over a specific area. Can the traxxis 55 be bow mounted? I too hate having to move back and fourth my 1442 alumacraft has a steering wheel so idk if theres really any room for a transom mount trolling motor. On the other hand a transom mount make things easier when pulking out and launching. As i would stay put. Honestly, it cost more than what I want to spend. But im ok with it if its what i need . The river I fish is pretty calm. Thanks for your replies. I felt i was always oversteering when I did have my t34 motorguide transom mounted. Post subject: Re: what size trolling motor so you have? Minkota edge 45lb thrust hand control. I'm setup for electric only 55 Minn Kota Maxxus? rear and a 50 Minn Kota Powerdrive front. This is on a Polar Kraft Dakota 1470. I had a #55 bowmount on my 1448. I have a #80 MinKota Maxxus bowmount with a Kipawa prop on my current 1656. 45lb minn kota. Has a battery light and a 18ft cord for the control but isn't quite big enough for the 1648. The foot control isn't as nice as one of the pedal styles and it's a pita to pull back up onto the boat tbh. If I did it over I buy a bigger, nicer one with the pull string and the pedal style foot control. This one you have to push one button to turn it left or right and it has a throttle button in the middle. It does alright though but not recommended. Last edited by rich250 on 26 Jul 2016, 16:16, edited 2 times in total. you guys have some nice setups. Thanks for the info. I'm leaning towards the Minnkota endura max 45lb. I'm not crazy about the swivel bracket made out of plastic and it will probably hold up fine. I'm just use to my motorguide being aluminum. I'm gonna try and transom mount it but I do want to make sure I can bow mount it. Just in case i don't like it. Just my opinion, but I owned a Motorguide 36 lb thrust prior to uprgrading to the 70 lb thrust Minnkota...the Minnkota is a much better built product all the way around. Yes any of the Minn Kota transom mount motors can be bow mounted. Have to loosen the control head and flip it around. As someone else mentioned mounting a transom mount next to a outboard is tight. I have to make sure my outboard is in the up position when operating the trolling motor so I dont hit the outboard with the prop of the trolling motor. Not a huge deal although spot jumping and contending with the river current can be tough at times. I spend 90% of the time trolling around fishing in backwaters so it works for me. 6 gallons of gas lasts me a year in the outboard.